Welcome to my website. I have attempted to keep each page of this website as straightforward and to the point as possible so that you can easily find the information you are looking for. In very simple terms, my aim is to help anyone to “be the best they can be” by applying the techniques I have studied, drawing on my research into and experience of self healing over many years. In addition, I bring to my professional coaching practice my experience as a successful business woman. Added to that is 50+ years of life experience, which has included 2 divorces, the birth of a beautiful son and the reality of juggling a career with being a single mother! After 4 years of being symptom-free from fibromyalgia, I decided to develop what by then had become my passion for personal development, in all senses of the word: physical, mental and spiritual. I wanted to help others who had been diagnosed with fibromyalgia. Firstly, I studied Reiki and became a Reiki Master and Teacher. I then went on to gain a diploma in Clinical Hypnotherapy (foundation degree level). This is the most advanced and comprehensive course available in the UK, offered by Liz Amesbury of Align Training. 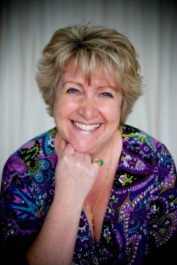 Liz works in conjunction with Central England College, and is a truly inspirational teacher. I also gained EFT qualifications to Advanced Practitioner level, with another inspirational teacher, Tania Prince. In addition, I learnt another wonderful technique developed by Tania with colleagues, called ‘Inner Re-Patterning’. I had previously credited the use of a combination of Hypnotherapy and EFT therapies for my own eventual wellness, and I embraced with enthusiasm the learning of these techniques in order to help others. I also gained a qualification as a Professional NLP (Neuro Linguistic Programming) coach, enabling me to work to support individuals and groups in achieving their goals on a personal and professional level. My passion and commitment to personal development continues. I believe we can have anything we want in life or we can have the excuse for not having it. For me, personal development offers us the opportunity to evaluate and remove our excuses. Maybe you have fibromyalgia, or other form of pain? Maybe you would like to eliminate the negatives from your life or your business? Or maybe you would just like to get to know and love yourself more?! I offer one to one support either by appointment to see me in person at my home in West Lancashire or via telephone sessions. I also run workshops for groups focused on increased wellness, happiness and confidence.